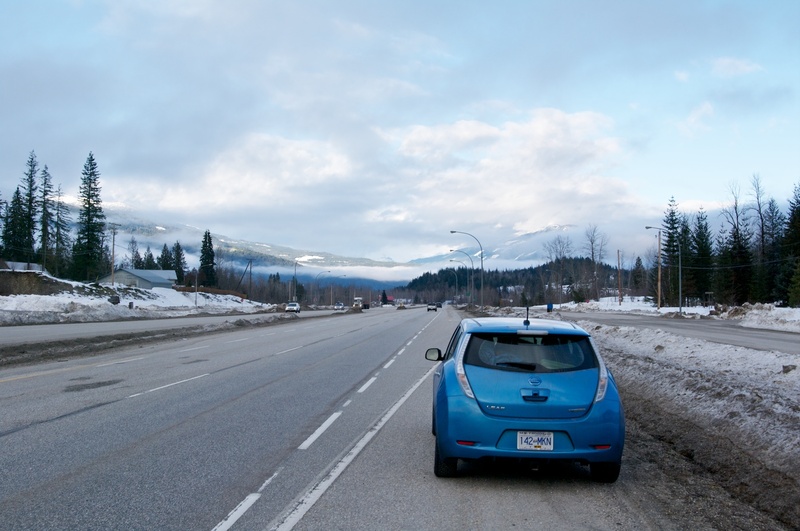 This is the third and final part of 3 posts on my trip from Nelson to Kelowna and back in February of 2015. Links to the earlier posts: Part 1, Part 2. 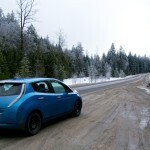 Part 3 covers my journey from Kelowna back to Nelson. The night before I was to leave for home, I started thinking about the other possible ways to get home. 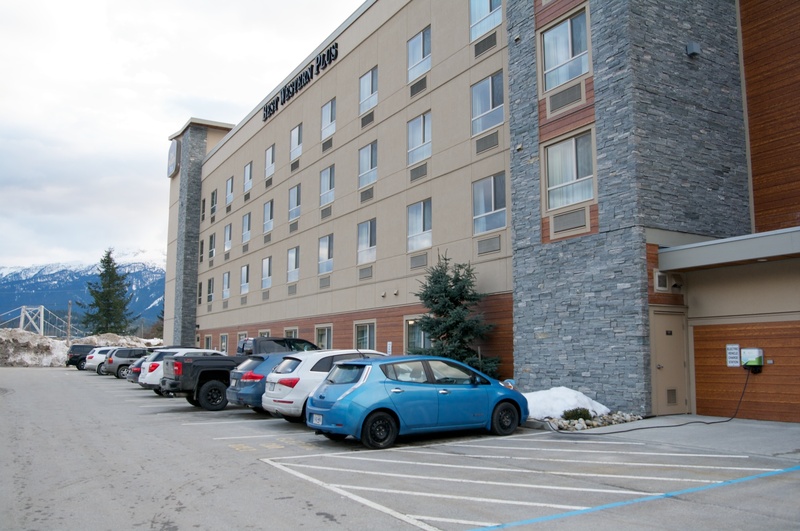 I had previously looked at different ways to the Okanagan based on the infrastructure available in the Okanagan valley in the summer of 2014. At that time I had ruled out the ‘middle’ route from Vernon to Needles/Fauquier (via Cherryville), it was just too far of a stretch at 355 km with only Level 1 charging opportunities along the route (that’s about 36 hours of charging!) 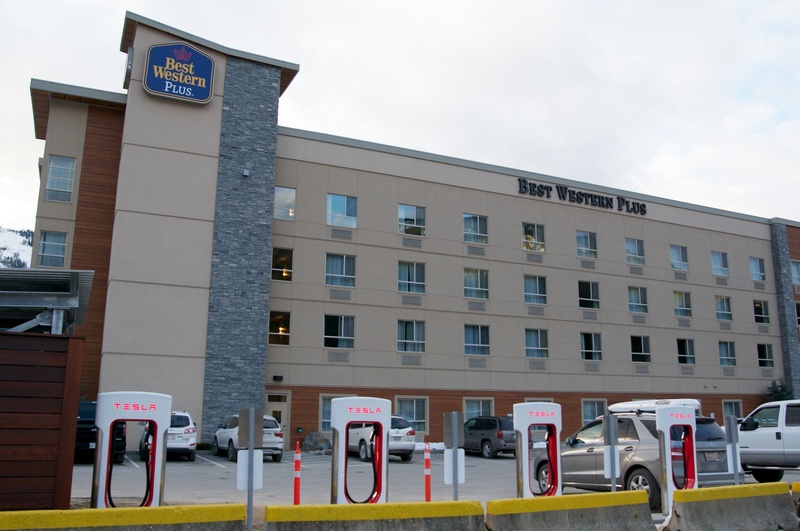 However, the northern route looked potentially promising, especially after Sicamous added a Sun Country Highway EVSE at their new visitor center, and the Best Western added an EVSE in Revelstoke. 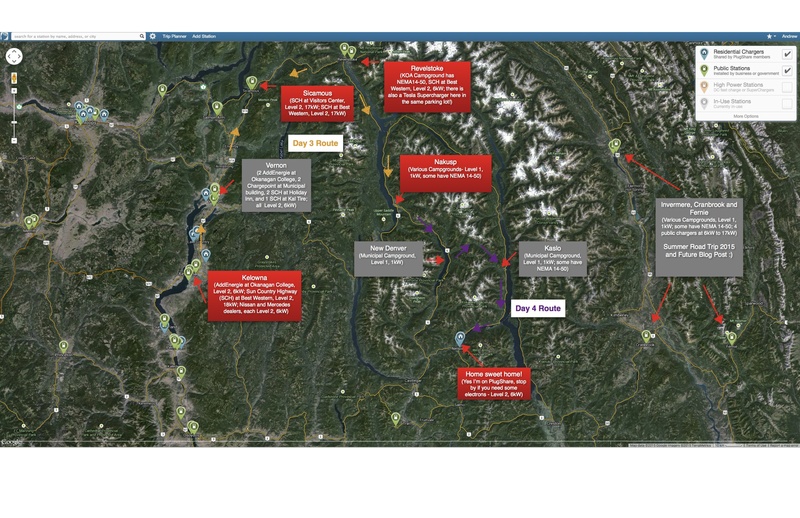 That brought the “Level 2 gap” down to only 250 km between Revelstoke and Nelson, comparable to the gap between Osoyoos and Nelson of 265 km. However, I have so far done that route by using the Rossland Level 2 charger as an island to hop-scotch to, which shortens the gap to 225 km. But, where you can Level 1 charge, coupled with the amount of elevation gained/loss makes a fairly large difference as well. 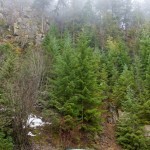 At least by “elevation finding” on Google Earth (as explained in Part 2), it appeared that the overall elevation gain/loss was less via the northern route than the southern one (in Parts 1 & 2 I took the southern route), and the trip finished at 535 m in Nelson instead of 1,050 m in Rossland. The morning I was to leave, I was still having some doubts about which way to go. Being February, there really are not that many campgrounds open. I was sure however that I would be able to reach the RV spots at Nakusp if they weren’t open (using a heavy-duty extension cord). The route from Nakusp to Nelson is still 150 km, which at regular speeds looked to be about 120% battery usage – but I figured I should be able to charge in New Denver at the campground as well in an emergency, and instead of driving regular speed I would just drive slower! 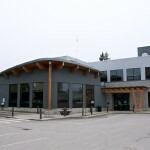 My last thought was to send a message to a friend in Fort St James (where we used to live for 4 years) who has a sister in Nakusp – my wife had met her sister in Nakusp once, but I hadn’t, so I was a bit reluctant to see if I could charge there overnight, especially with their second child having been born only a month prior! 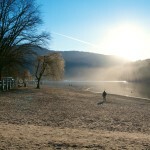 I left Kelowna at just after 10 am and headed to Sicamous, driving at about 80 km/h. A good portion of this route is two-lanes, which was great. From just north of Armstrong to Enderby it goes down to one lane though, and for a Sunday morning I was a bit surprised to find that doing 80 in the 90 (sometimes 100) zones really got on a few of the locals nerves! The only honk from someone annoyed with my speed over the entire trip came during this stretch, go figure. I stopped for photos a number of places along the way and enjoyed the drive for the most part. 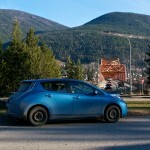 I arrived in Sicamous just after noon and had a “snack” lunch in the car while looking at my trip values so far. Generally I was doing a bit better and was arriving at my destination with more charge than my Trip Planner spreadsheet was estimating, which I was ok with! I decided to head out for a walk to pass the time… not much to see in Sicamous on a Sunday afternoon in the off-season, pretty much nothing was open except for a pub. I had been driving without the heat on to save some energy, so was happy to sit in a warm pub for an hour and eat a burger while waiting for the car to finish up. While in Sicamous, I heard back from my friend in Fort St James that her sister could accommodate me that night and left me her phone number. I called and Jaimie was incredibly welcoming, despite me noting that I probably wouldn’t get there until a little after 9 pm. 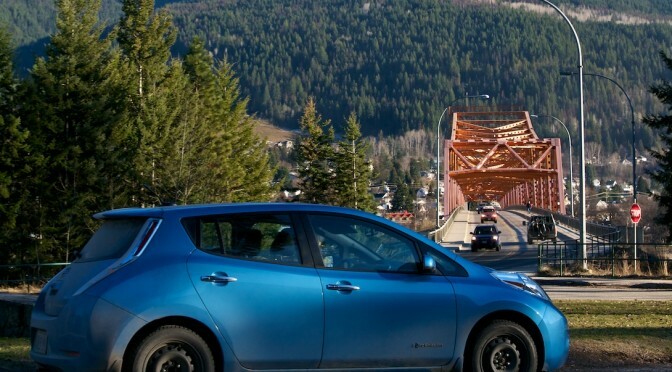 Feeling better about my prospects of getting a charge and sleeping in a house for the night, I left Sicamous at about 3:30 pm and got on Highway 1, the Trans-Canada. 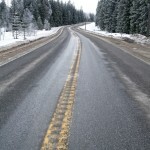 This section of highway is notorious for accidents (between Chase and Revelstoke especially), so there was no way I would try driving under the speed limit on this portion. 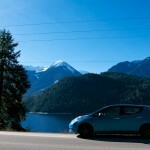 Speed sure makes a difference on energy efficiency – from Kelowna to Sicamous I had predicted 7.3 km/kWh averaging 70 km/h; for Sicamous to Revelstoke, I predicted 5.6 km/kWh averaging 100 km/h – at about 2°C, that would bring my maximum range down to only 110 km! 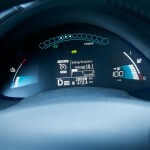 I actually obtained 7.9 and 5.9 km/kWh respectively. 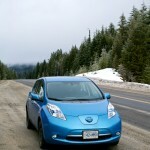 I rolled into the Revelstoke EVSE at 4:25 pm, having burned through 66% of my battery in only 73 km. That is one of the biggest differences in ‘fueling’ an EV vs a gasmobile, which will lead to changes in what we expect to see for infrastructure. 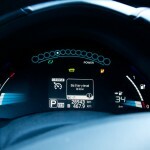 We won’t ever need as many Level 3 (Quick Charger) stations as society has needed for gas stations, simply because the majority of people will have access to an overnight Level 1 or 2 charger at their home, apartment (check out the Vancouver mandate for multi-family homes) and/or office in the future. 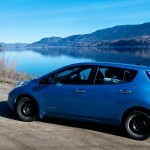 Quick Chargers will largely only be used to travel longer distances within a region or between regions, especially once longer range EVs become common (Chevrolet Bolt to be released in 2017, possibly a new Leaf too). 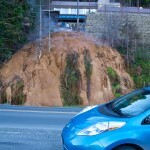 Of course there is one car that is in the future already (if you have enough money) – the Tesla Model ‘S’ could have driven from Kelowna to Revelstoke in one go, charged for a ½ hr at the Supercharger, in the same parking lot!, then carried on to Nelson in one go as well, arriving home later that night. I have to say, this is the one time during my journey that I was really feeling the passage of time. When you have no other option but to wait and do something else while your car charges, you pass the time and no big deal. 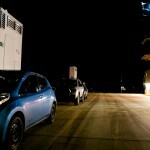 But to have those softly glowing Superchargers taunting me from the other side of the parking lot was too much! 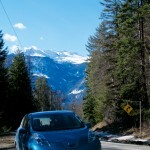 I was also disappointed that the chargers were all near the highway – it is a fair distance to get to the actual townsite of Revelstoke from the highway. 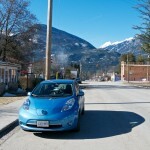 Having said that, PlugShare now seems to show a Level 3 Quick Charger near the downtown, so Revelstoke just went much higher on my list of future destinations by EV – I am writing this less than 2 months after I went through… it would be a bit painful to find out that the charger was actually working in February but just hadn’t been shared on PlugShare at that time! 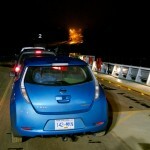 I got out of Revelstoke at 7 pm and headed to the ferry, loafing along at 60 – 70 km/h, and I was in between any traffic from the sailings – so I didn’t see anyone until I reached the ferry line up… which ended up being me and only a handful of other vehicles. 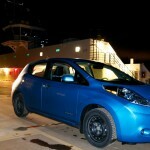 I had a pretty humorous moment while on the ferry: as we were leaving the shore, the ship had its lights on and I tried to snap a few quick photos of the car on the ship. They came out a bit blurry, so I pulled out my tripod and set up for a few shots. One of them I did on the ‘lit’ side of the car, then I went to the other side and did a long exposure plus flash to light the ‘dark’ side of the car. It took a few shots to frame the car right, and as I fired my third shot, the PA system turned on, and a slightly miffed sounding Captain came over the air, “please, stop doing that”. He said something else, which I didn’t catch, but presumably it had something to do with navigation etc. Thankfully the last photo worked! Ahh, right angle, but my flash blinded the navigation! 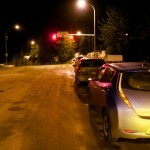 I arrived in Nakusp at a little after 9 pm, having driven fairly slowly to conserve charge. 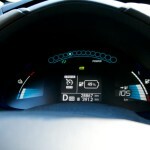 As noted in Part 1, it is much faster for overall trip time to drive slowly so that I would not have to charge as long using Level 1. 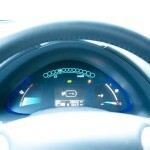 So again I drove at a relaxed 60 – 70 km/h, doing what I could to conserve energy. I arrived having attained an efficiency of 8.0 km/kWh, despite this section having the most elevation gains/losses out of my planned trip home. Jaimie and Patrick were incredibly welcoming, inviting me in to their home and staying up to talk for a while. I charged using an outlet in their carport and it all worked without any hitches. The next day dawned clear and blue, but I had to wait to leave until about 10 am to have a full charge. 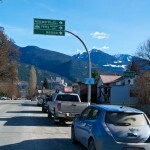 The typical route from Nakusp to Nelson is to travel south down the Slocan Valley, which is about 145 km; the alternate route is to head over highway 31A from New Denver to Kaslo, and then travel south down Kootenay Lake and back east along the west arm, a distance of about 160 km. With the clear weather (meaning the mountain views would be spectacular), I started contemplating whether I could make it over the pass to Kaslo and travel that way instead. Again the municipal campground is pretty accessible in the off-season if I ended up needing some juice. 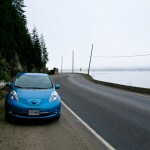 Also, 160 km is about 100 miles; when the Leaf first came out, Nissan had advertised it as having 100 miles of range; the EPA only rated it at about 75 miles. 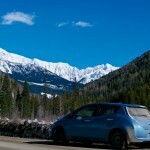 Many people found the EPA estimate to be more accurate, and people were having problems getting close to 100 miles in a charge at all, so a ‘competition’ of sorts was spawned on the mynissanleaf forum. So far in my experience with the car, I have found it fairly easy to get 140 km of range, and once I had reached 155 km, but I had never tried over 160 km, and definitely not greater than 160 km of mountainous terrain! So, with that in mind, I left Nakusp driving at a relatively slow pace of 40 km/h (very light traffic means this was still safe!) I pulled over a fair amount to take photos as well, since the day was so nice. I arrived in New Denver at about 11:45 and still had not made up my mind. 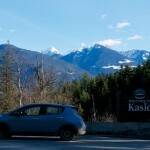 I found a parking spot on the road heading to Kaslo (rather than on the road to Nelson) and stopped for a bite to eat – I think my sub-conscious had already made the decision. 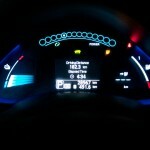 I had made it to New Denver with an efficiency of 9.3 km/kWh and 76% of my battery remaining. I could have easily made it to Nelson from this point by heading south down the Slocan Valley, but the sense of adventure called to me, so I put the cruise control at 40 again and headed up the hill out of New Denver at 12:15. 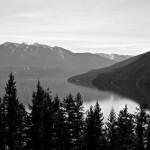 Near the top of the climb between New Denver and Kaslo, looking towards the east – I love this view! 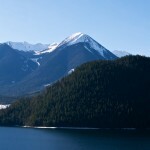 About half-way between New Denver and Kaslo, I had 49% battery… I reached Kaslo 20 km later with 48% battery! Look at that efficiency value! 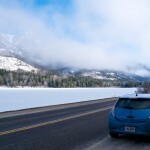 I travelled at 60 km/h on the road from Kaslo to Balfour, then 70 km/h from Balfour to Nelson as I became more confident that I would make it and the traffic volume increased. 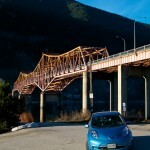 ‘Low Battery’ warning came at 17% having travelled 159 km; a few kilometers later I was at the Orange Bridge heading into Nelson – success! Now that I was close to home, I decided to try and push the car as far as I could to ‘Turtle’ mode (the car goes into low power mode at this point and you have about 1 km to get it off the road safely; an icon that looks like a turtle was supposed to light up to indicate this mode, I had never seen it). I headed downtown and back (about 8 km), then drove some loops through the neighbourhoods near my house. I reached ‘Very Low Battery’ at 8%, having driven 172 km with efficiency of 9.8 km/kWh – Pink Floyd’s “Time” came on within a few seconds of the warning, which I thought was pretty humorous. Shortly after the car reached 6% battery, the display changed to “–%” instead of showing a value, this happened at 175.5 km. I have only driven the car down to “–%” once before, so wasn’t sure what to expect from this point. 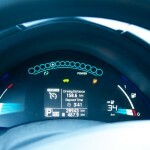 I still had one bar lit, but after 180 km, the last bar in the battery gauge disappeared. I eventually got bored of driving laps so headed home without seeing the magical (mythical?) turtle and finished at 182.3 km, or 113 miles! 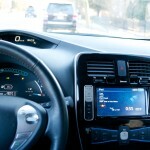 At 8% battery remaining, the car announced “Very Low Battery Charge” – Pink Floyd’s “Time” had just came on! 6 km further and the last battery bar disappeared, but still no turtle! 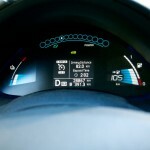 This was by far the longest journey I had done in one charge in the car, and while it wasn’t travelled at practical speeds, I have gained the knowledge that if I am ever coming up a bit short on charge to get from one place to another, all I need to do is slow down and I can still make it. I look forward to future years when stories like this are kind of like listening to your great-grandpa tell you about how he had to walk 5 miles to school and that it was uphill both ways! In closing, I want to remind my readers that for >95% of my driving, this car is perfectly suited to my needs – I charge overnight, the car is ready to go (and warm!) in the morning, I charge a bit at work, then I drive home. No muss, no fuss. I happen to enjoy pushing the car a bit and exploring my comfort limits, which is where trip reports like this come from. My next trip report will be of a more local nature, without any worries about charge level etc. 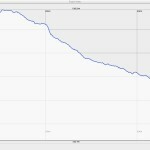 As noted in Part 1, I tracked each drive segment with a GPS program on my phone to see how much elevation I had gained and lost to compare it to my estimated values I obtained from Google Earth. One interesting result was that I found out that there is 125 m MORE elevation gain and loss between Kaslo and Nelson then there is between Kaslo and New Denver, despite the mountain pass in between Kaslo and New Denver! 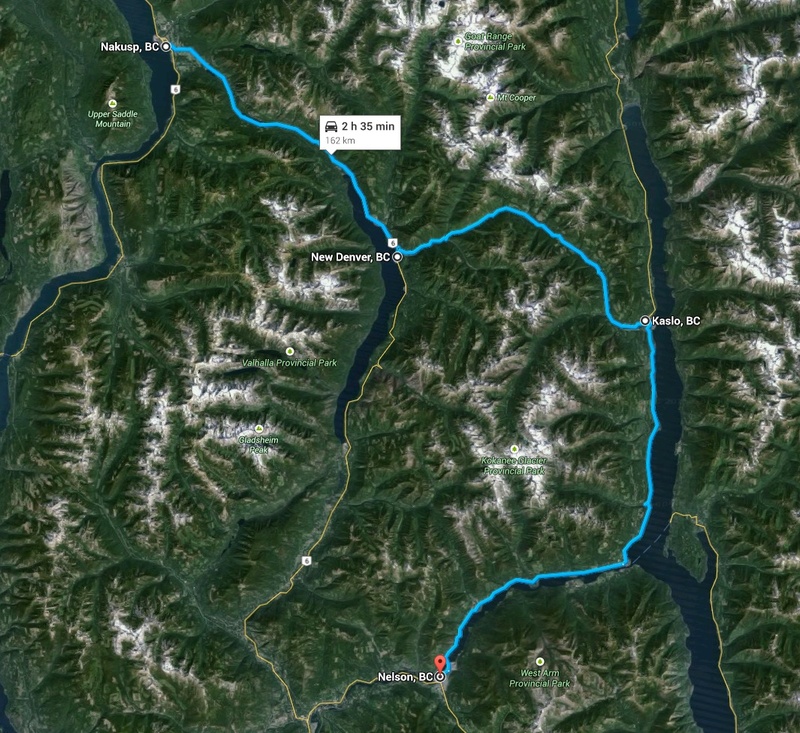 That was really surprising to me, since the road travels along the lake for a large chunk between Kaslo and Nelson. 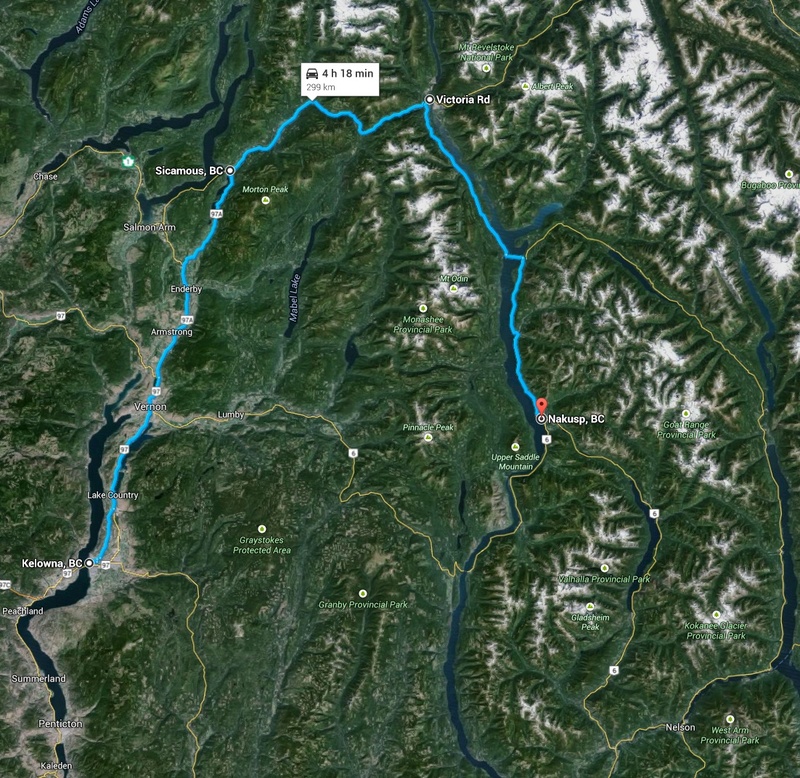 All those bumps add up to 125 m more elevation gain/loss between Kaslo and Nelson then between New Denver and Kaslo! And just yesterday, I discovered a new trick on the Google Maps website – input the trip you want to travel (type in say “Kaslo to New Denver”), and you will see the driving distance and time. Click on the “…” in the row of icons that look like modes of transportation and you will see one that looks like a bike, click on that and all of a sudden it will show you elevation gained and lost! I compared it quickly to a number of routes I have previously estimated in Google Earth and tracked via GPS and it is pretty close, within 20 – 50 m anyways, which is close enough for estimating range in my spreadsheet. 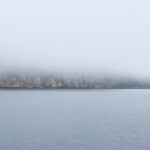 Great blog, I enjoyed reading it. 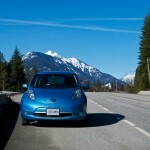 It’s so nice to drive long distances in a LEAF, especially in mountainous areas. Funny coincidence, I’m also LEAF owned AND a Pentax user (a VERY rare combination I suspect 😉 That K-7 was very nice for me (I now have a K-3). Thanks for your comment Manu. My trusty K7 was preceded by a K10D. 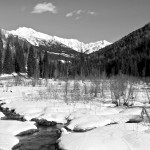 I was very much looking at the K3 this spring when the K3II came around – decided on the 20-40 lens instead. Cheers!